Paytm is here with a great Recharge cashback offer. Flat 100% cashback on First Mobile Recharge of the month (max Rs 50). Valid for a user once per month. This offer is working on the first recharge of the month. So, Grab the offer now …!! 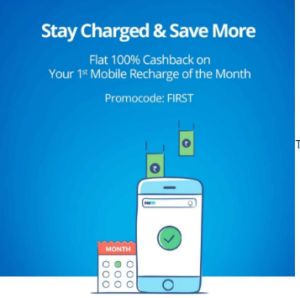 How to get Flat 100% cashback on First Mobile Recharge of the month (max Rs 50)? 6. Select a suitable payment option and pay the amount. *100% cashback up to Rs. 50 on recharge or bill payment. *This offer is valid on the first recharge of the month. Its not the first recharge of the month ! Its first recharge of the paytm account !